Grilling the perfect, tender and tasteful ribs to the perfect smoky texture is quite a challenge for the BBQ lovers out there. Smoked ribs is an incredibly popular delicacy, but getting the right smoky texture and taste is not so easy. That’s the reason many people are willing to try grilling this delicious food at home. Another issue is that there are different types of ribs derived from pigs, cows and lambs and each is cooked in different ways. 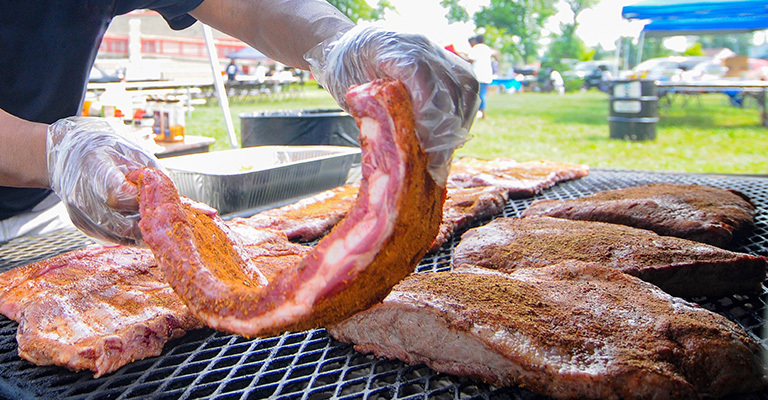 If you would like to try your hands in grilling ribs then this article is your best bet. 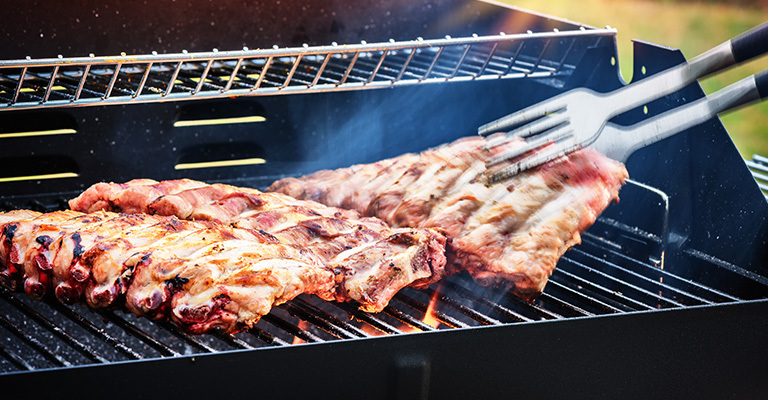 Here at Grills Forever, we have mentioned a general method on how to cook ribs on a gas grill, as well as on a charcoal grill, to get those smoky ribs you always desired. 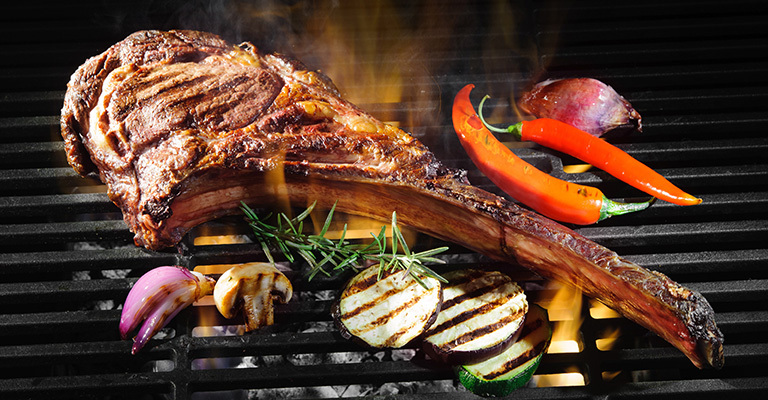 Truth is, indeed it takes a long time to grill using natural gas but the results are worth it. If you want to smoke your grilled ribs but do not have an electric grill or charcoal grill then this method might just be the right choice for you. 1. Fill the smoker box of the gas grill with wood chips, preferably hickory or cherry wood. 2. 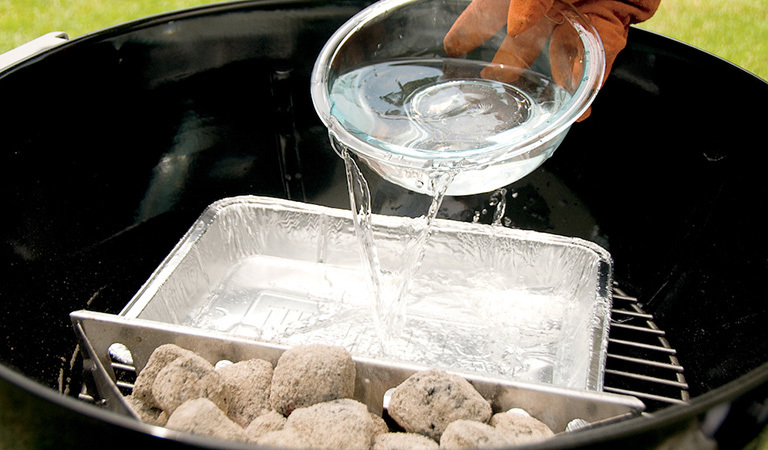 Fill 3/4th of a pan with water and keep it next to the smoker box. 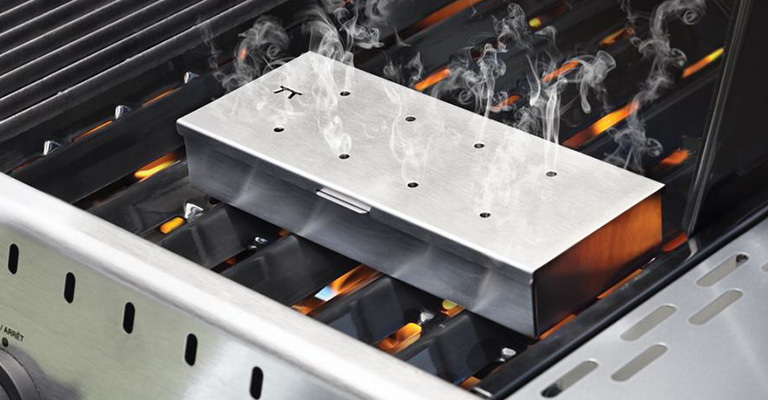 Light the heat under the smoker box and set it to high temperatures. 3. Preheat the grill for around 20 minutes. Prepare the rim rub and coat it on all sides of the rib meat. After an hour or so, proceed to the grilling process. 4. Then place the ribs opposite to the smoker box. The rib pieces have bones so ensure the bones face down while the meaty part stays up. 5. Allow the ribs to cook for 1 or 1.5 hours. Make sure to refill the smoker box with wood chips and fill the pan with water every once in a while but not too often. Doing too often will drop the temperature down a bit and slow down the cooking process. 6. Shuffle the positions of the ribs. So the ribs closer to the heat are now moved away to another side and the ones a bit far away are brought closer. This is done to prevent overcooking. Close the lid and cook for 1.5 hours at least. 7. Turn the ribs upside down. So this time the bone side would face up. Cook the ribs like this for around 45 min. Keep checking if wood chips or water need to be refilled. 8. Swap the positions of the ribs and cook for another 30 min after closing the lid. Use this time to prepare a barbecue sauce. 9. Coat all sides of the ribs with barbecue sauce and set the all burners to high. Remove the water pan. 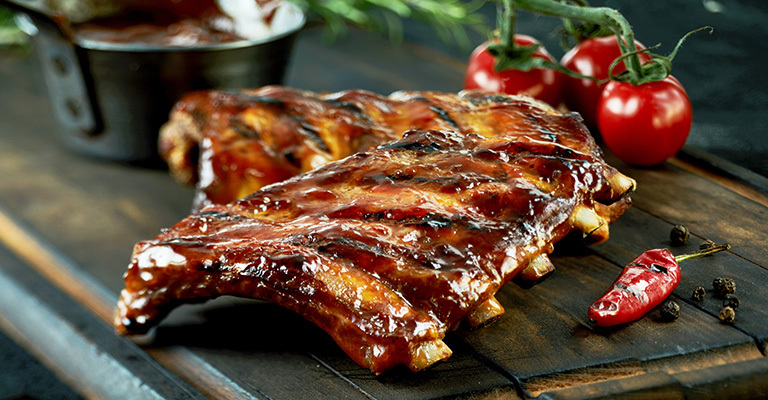 Allow the barbecue sauce to set on the ribs for 10 minutes after removing them from the grill. 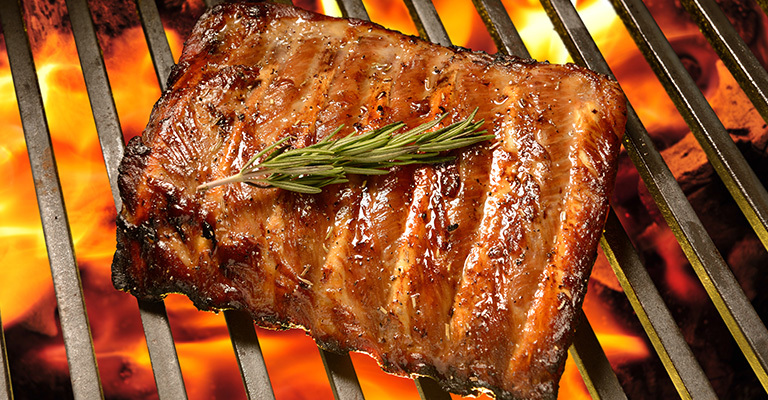 Grilling ribs on gas is a more slow and controlled process that can be easier for people who just got into grilling. However, those who want to get the best grilled ribs in a shorter period of time with heavy smoky texture, this method is perfect for them. 1. Remove the rib membrane from the ribs, as keeping this on makes it more difficult for the ribs to get tender. Remove any loose meat. 2. Sprinkle rib rub all over the ribs and ensure to heavily coat them. Let the flavor sink in for a while. 3. To begin the process of grilling you will need two aluminum pans. 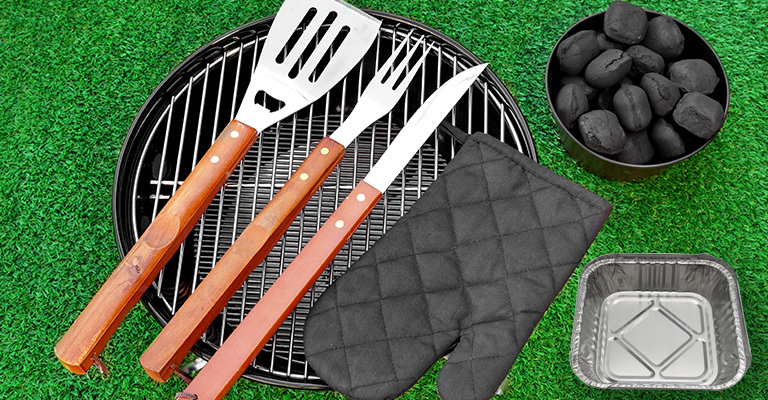 Use enough charcoal so that it covers half of the coal grate, which is around three layers of charcoal. 4. 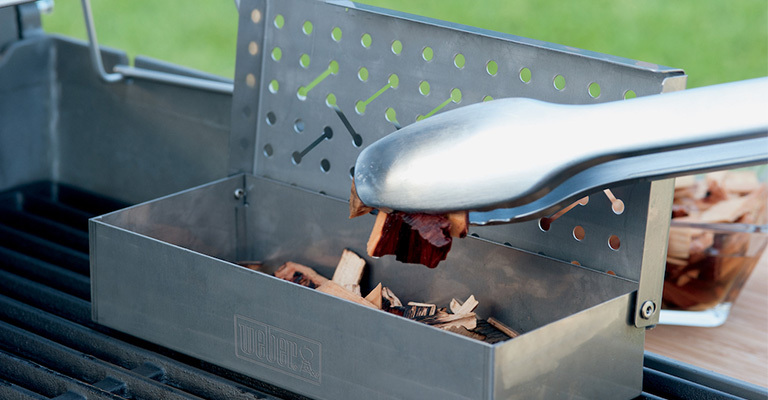 Place an aluminum on the charcoal grate and pour some charcoal on to the other side. Then add long chunks of wood. This is because the larger the word, the more time it takes to burn hence more smoke. 5. 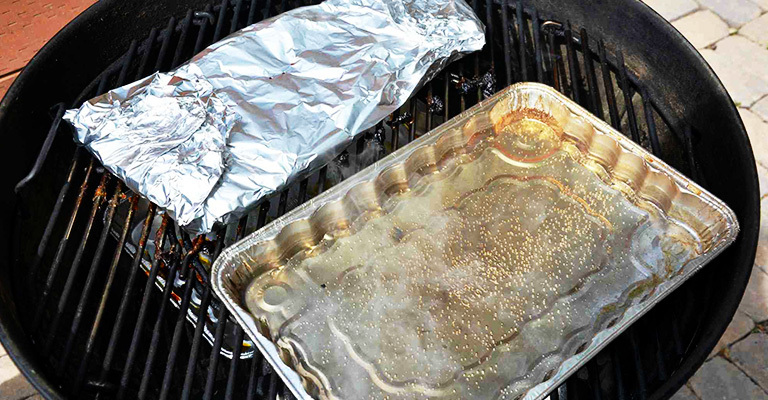 Place a second aluminum foil directly on the charcoal grate and fill it with water. 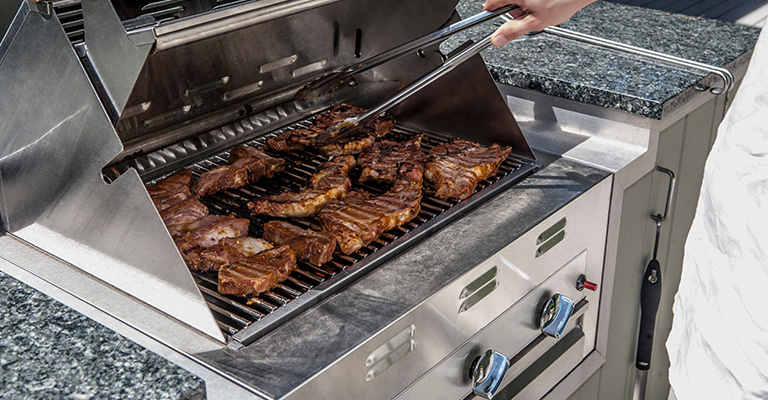 Keep the grilling temperature at around 250 F. As the water heats to steam, it will keep the ribs in low heating. 6. Place the ribs next to the water-filled aluminum pan and cook for around 3 or 4 hours. Ensure that the final temperature reaches around 180 F. Also turn and swap the positions and sides of the ribs for even cooking. If need be, replenish the water and coal from time to time. 7. After about an hour wrap the ribs with aluminum foil in double layers. Place the wrapped ribs on to the grill and cook for another one hour. 8. Remove the foil and cook for another 30 minutes. Now that it is nearly done, coat the ribs with barbecue sauce in thin layers. Repeat this about 5 times. Then remove the ribs. 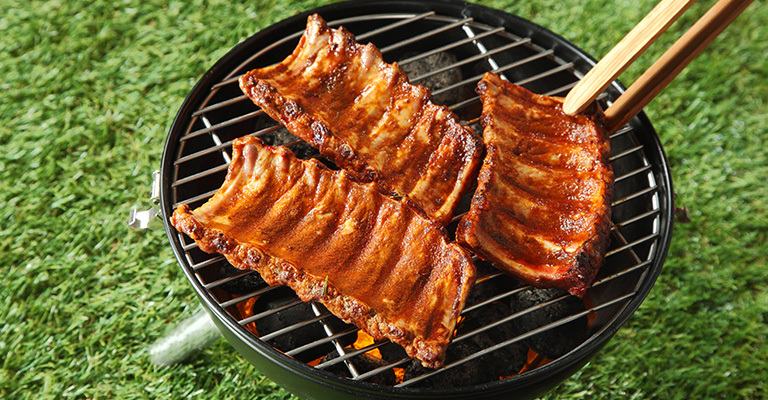 How long to grill ribs: Ideally for this method, you could opt to use rack of lamb or pork spareribs, but if you use baby back pork ribs then reduce 5 mins of cooking time in each step of the process. 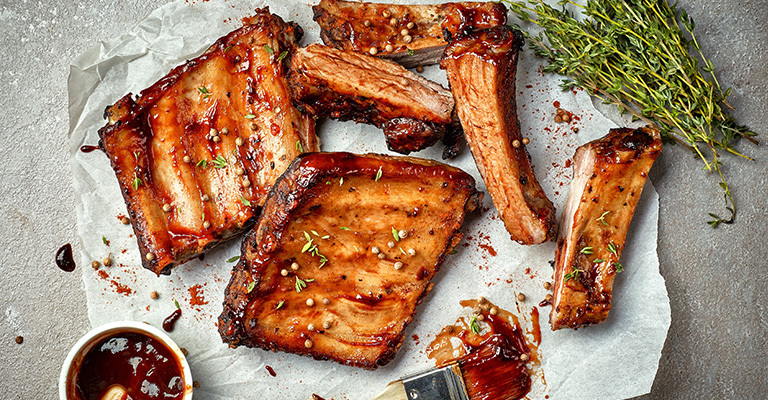 Using rectangular shaped spareribs is a better option as cooking it evenly would be much easier. The whole process should not take more than two hours. 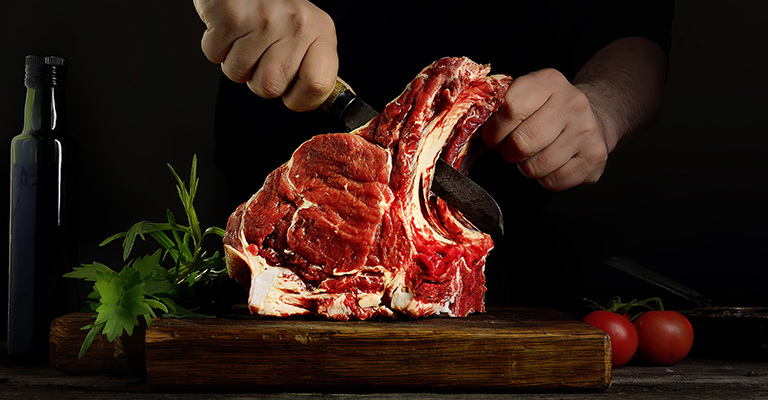 Trimming hacks: If the ribs are uneven, do make sure to trim away excess meat or fat and remove any connective tissue before cooking the ribs. In fact, trimming is quite a popular option. The lower ends of the spare ribs are cut to create rib tips, and the curved part of the ribs split in half is cut to create riblets. 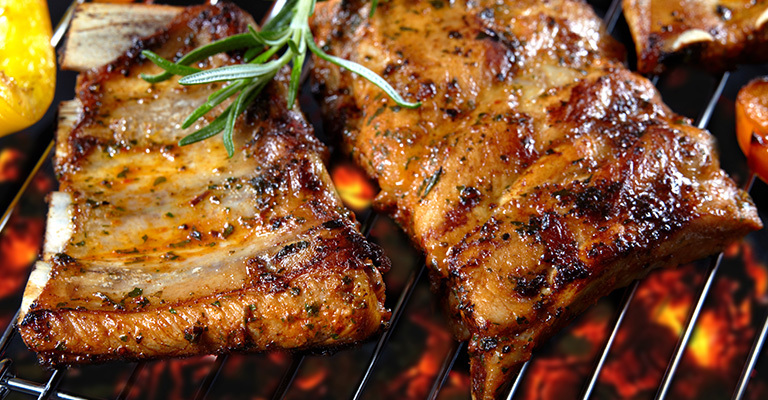 Both rib tips and riblets can be separately grilled. How to prepare rib rub: The rub should heavily coat all sides of the rib and should be applied evenly. Mix, 1 tbsp cumin, 1 tsp white pepper, 1 tsp cayenne pepper, 1 tsp black pepper, 1 tbsp paprika, 2 tbsp kosher salt, 1 tbsp brown sugar, 1 tbsp granulated onion, 1 tbsp granulated garlic and 1 tbsp chili powder into a large bowl and keep it in an airtight container for further use. 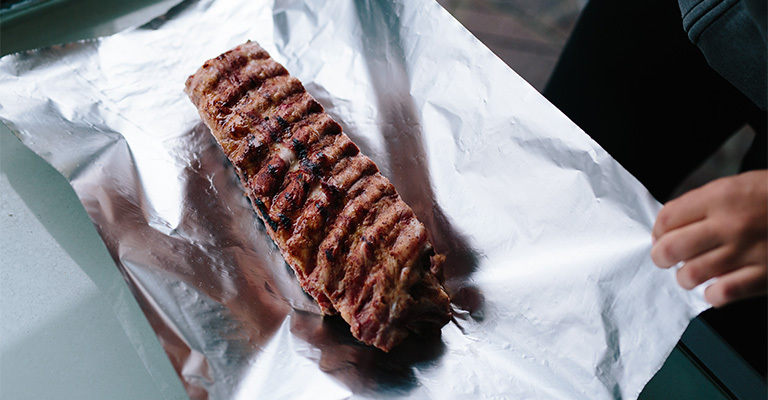 Aluminum foil use: if you want your ribs to be smoking hot, then you can add an extra two hours of cooking at the end by wrapping them in aluminum foil with apple juice coated on the insides. Close the lid and increase the temperature so that the juice can steam the meat and tenderize them for 30-45 min. 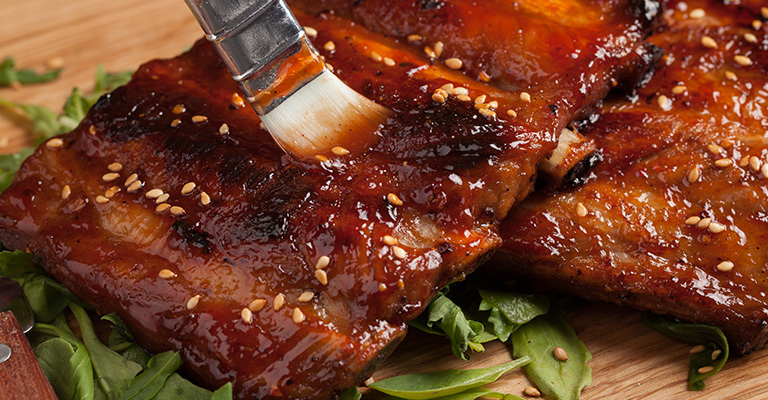 How to prepare barbecue sauce: For ribs grilling, coat a heavy amount of barbecue sauce. 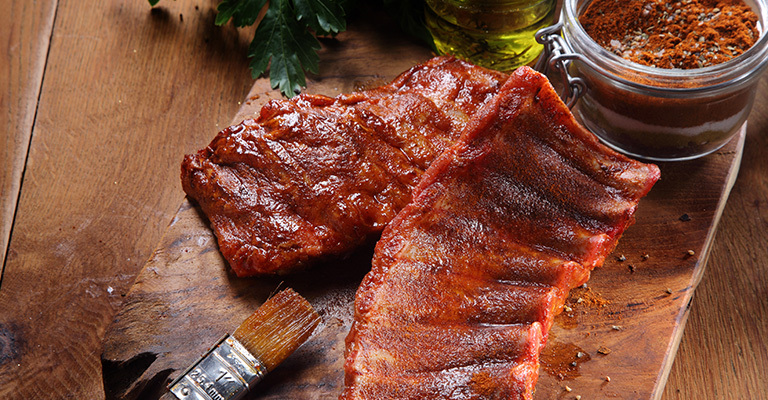 To prepare a barbecue sauce for ribs, heat a pan to medium level and add 2 tbsp olive oil. When the oil is warm enough, add ¼ cup minced onion and water which should be made into a puree. After simmering for 3 minutes, add 2 cups of ketchup, 1/3rd cup brown sugar, 3 cloves of crushed garlic, 1 tbsp tomato paste, 1 tbsp Worcestershire sauce, 1 tbsp apple cider vinegar, 1 tsp dry mustard and fresh ground pepper. Mix all the ingredients and allow to simmer for 30 minutes. 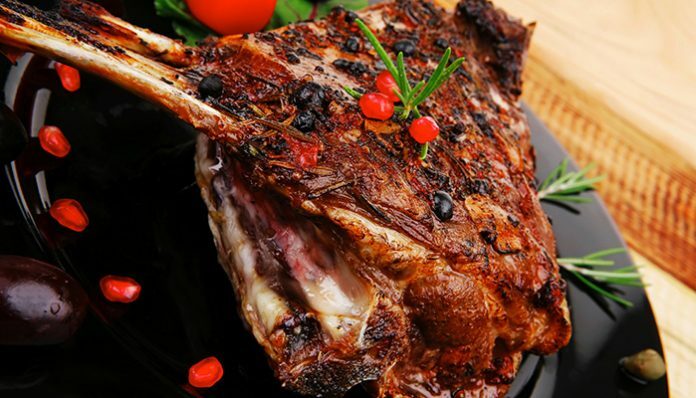 These are two general ways of cooking deliciously grilled ribs but there are also other recipes that you could try. 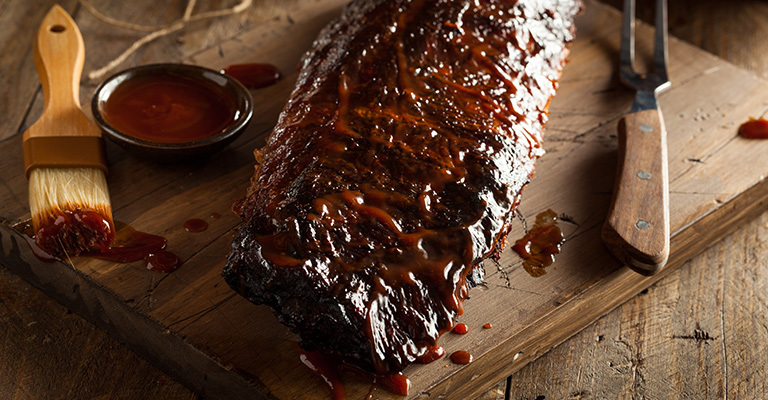 There are different types of rib rubs and rib barbecue sauces that can be made to enhance flavors. Also for beef ribs and lamb ribs, the rubs, sauces and brine composition can be different but the techniques are all fundamentally the same. So any of these two methods can be used to cook the perfectly smoky grilled ribs of your choice. 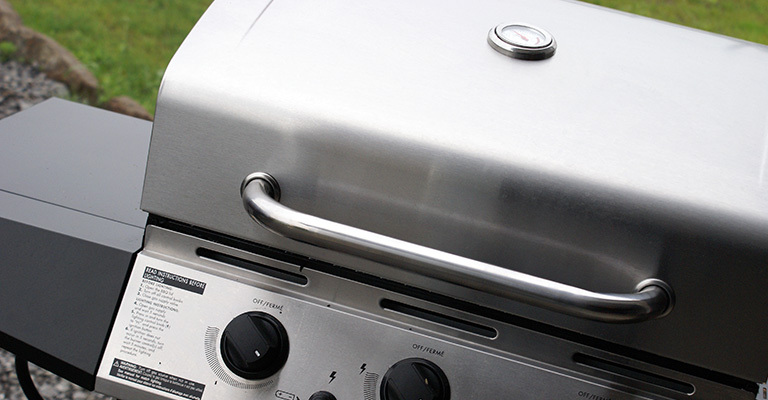 Previous articleHow to Clean a Grill: A Guide to a Spotless Grill! Wow you guys covered everything! Finished the whole article in one sitting!